The solution is simple to customize the paging file pagefile.sys in Windows 8.1, 8 and 10, (size of virtual memory)! 1.) ... Open the setting for the swap file (pagefile.sys) in Win 8/8.1! 2.) ... Customize the paging file (virtual memory) in windows 8.1 / and win 8! 3.) ... What should be considered when change the paging file (pagefile.sys)! Info: from Windows 10, there is the swapfile.sys, this is also used for swapping and is located on the same drive as the pagefile.sys. See also: How to see hidden files and folder and file name extensions in Windows 8 / 10 Explorer? 1.) Open the setting for the swap file (pagefile.sys) in Windows 8,8.1 and Windows 10! sysdm.cpl ,3 (... see Image-1 Arrow-1)! In advanced "System Properties" select the Tab "Advanced" (... see Image-1 Arrow-2) and click the Button "Settings"
In Window "Performance Options" select also the tab "Advanced" (... see Image-1 Arrow-4) and click the Button "Change..."
In "Virtual Memory", please uncheck the box "Automatically manage paging file size for all drives"
(... see Image-1 Arrow-6). Read this: ... Customize the Virtual Memory! (Image-1) Open the settings of the paging file pagefile.sys in Windows 8.1 and 8! 2.) Customize the paging file (virtual memory) in windows 8.1 and Windows 10! In this example disable the virtual memory on C:\ Drive (Volume) (... see Image-2 Arrow-2)! And use custom size for the swap file (pagefile,sys) on H:\ (:SWAP:) (... see Image-2 Arrow-1)! Please dont forget the button "Set" (... see Image-2 Arrow-3)! (Image-2) Customize the paging file pagefile.sys in Windows 8.1 and 8! 3.) What should be considered when change the paging file (pagefile.sys)! When you move to another disk, it should be no external disk! At best, use the fastest hard disk on the operating system! The different than Windows XP, Win 8.1 and 10 can start without paging file. And the paging file (virtual memory) can be re-adjusted if necessary. See also: How to set in Windows 8 / 10 associations for file type: open with multiple programs or apps? Windows-8 - FAQ-133: Customize the paging file pagefile.sys in Windows 8.1, 8 and 10! Set pagefile size in win8.1? Windows 8.1 how much ram disable pagefile ssd? Windows 8.1 paging file how to customize? Window 8.1 wipe pagefile guide? How to disable pagefile.sys in windows 8.1? Guide Paging File Windows 8.1? Manual Windows 8 move paging file? How to increase sixe of swapfile in windows 8.1? Set paging file windows 8.1? Windows 8 1 paging file size? How to modify the swapfile in Windows 8.1? Windows 8.1 Page File Size? How to reduce paging file and hiber file in windows 8.1? How to open pagefile setting windows 8? How to set page file in windows 8.1? Windows 8.1 page file on seperate drive? Set pagefile manually windows 8.1? Recommended paging file size windows 8? Move Page File Windows 8.1? Good size for hiber file windows 8.1? Where is paging file on windows 8.1? Paging file size windows 8 computation? Windows 8.1 move hiberfil.sys pagefile.sys swapfile.sys? Win 8.1 2 hard drives for virtual memory? Individual customice of Page file windows 8.1? Paging file settings in windows 8.1? How much page file windows 8.1 uses? What is pagefile.sys windows 8.1? Correct virtual memory size for win 8.1? Tutorial Windows 8.1 disable paging? Windows 8.1 is it safe to disable pagefile? Where is paging file win8.1? Windows 8.1 swap file Individual customice? Set page file in windows 8.1? Change windows page file location windows 8? Delete paging file windows 8.1 home? How to disable page file windows 8? Where to change paging file windows 8.1? Set pagefile size in win 8.1? Modify paging file windows 8.1? Windows 8.1 eliminar paging file? How to increase the page file in windows 8.1? How to check paging file size in windows 8? How to access the paging file on windows 8.1? Windows 8.1 virtual memory size? What to set paging file for virtual memory oin windows 8.1? Windows 8.1 page file size to change default page file for ssd on windows 8.1?? What is the pagefile.sys in 8.1? Windows 8.1 reduce side of pagefile.sys? How to create pagefile (swap)windows 8.1? How to find Windows 8.1 page file? What is pagefile.sys in windows 8.1? No paging file windows 8.1? Individual customice 8.1 page file? 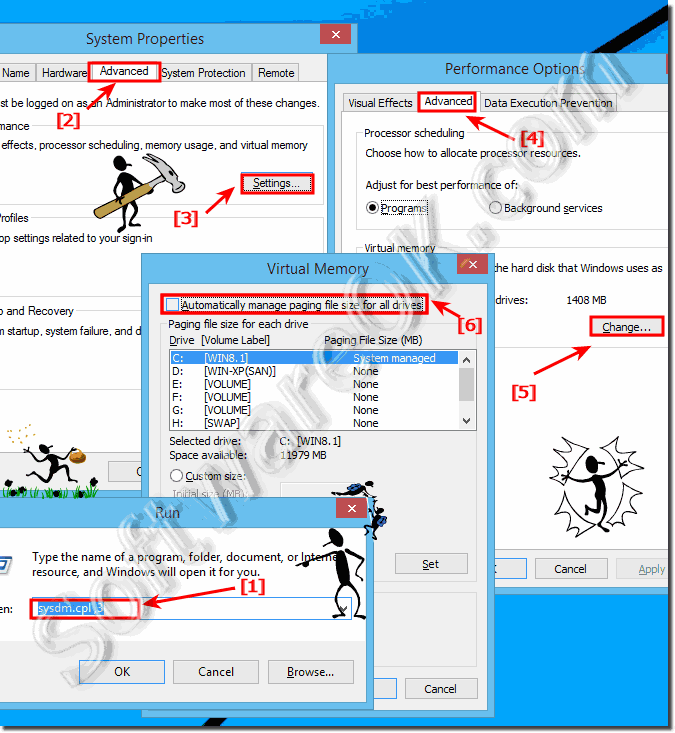 Tutorial to customize Virtual memory windows 8.1? Instruction to find Pagefile windows 8.1? How to move the paging file windows 8.1? Should i disable pagefile in windows 8.1? How to find pagefile.sys on windows 8? Ideal size pagefile.sys Windows 8.1? Prevent windows 8.1 from swapping? Windows 8 1 page file settings? How to stop windows 8 from page swapping to hard drive? Guide for Windows 8.1 pagefile settings? How to change page file memory 8.1? Windows paging file location windows 8.1? HOW TO MOVE PAGING FILE ON WINDOWS 8.1? How to crate pagefile (swap)windows 8.1? Increase size of pagefile for windows 8.1? How to change the page file on windows 8.1 64b? What is the best computation for virtual memory setting for windows 8? Windows 8.1 did you need swap file? Change pagefile location windows 8.1? Ready boost optimization for windows 8.1? Disable paging file windows 8 guide? Windows 8.1 paging file size? Does windows 8.1 need a swap file? Win 8.1 change page file size settings?